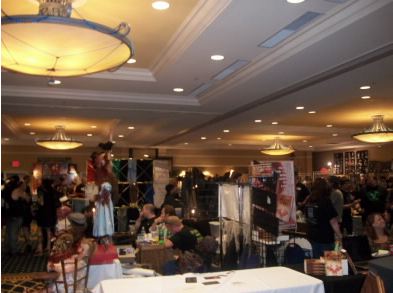 I attended HorrorFind Weekend last year for the very first time and was floored by the low turnout. There were almost no lines for the guest autograph sessions, and the vendors could have used a few more customers (though I heard it wasn't the worst convention for them). The event overall seemed well organized and fun, but it was really strange that there weren't a ton more people. The next one in 2010 moved from Hunt Valley, MD to Gettysburg, PA. Wowza, what a difference! The convention hotel was sold out, and two other nearby hotels were also nearly full. There was no places to park when I got there. This was going to be a huge horror convention. I bought some extra zombie blood from a vendor, since the stuff I came with kept drying up and flaking off quickly. Thankfully I found the same stuff to match, and I only needed one more tube to keep up my zombie appearance. There was a huge crowd in the vendors room. It was ridiculous! I got to see some of the guests and the waits in line weren't terrible at all, but it was fantastic. I look forward to going back every year.